June 5, 2018—Hitachi Chemical Advanced Therapeutics Solutions, LLC (HCATS), a US subsidiary of Hitachi Chemical Co. Ltd. that engages in contract manufacturing and development of regenerative medicine products, and Invetech, a global leader in the development and production of automated manufacturing solutions for cell and advanced therapies, today announced a collaboration agreement to commercialize an automated platform for cell therapy manufacturing, the Counter-Flow Centrifugation system (CFC). The collaboration will significantly enhance the development and manufacturing capability available to the cell therapy market, helping to deliver commercially viable therapies to patients in need, more quickly, at reduced cost and with greater product confidence. The CFC is a flexible, fully-automated platform designed as a key technology in clinical and commercial manufacture of cell therapies under Good Manufacturing Practice (GMP) regulations. The CFC is designed to accommodate research, pre-clinical, clinical and commercial manufacturing of cell-based therapies using closed single-use disposables. It provides a robust solution for small-scale processing suitable for GMP manufacturing of autologous and other patient-specific products, while also supporting efficient development of small and large-scale processes at lower cost. 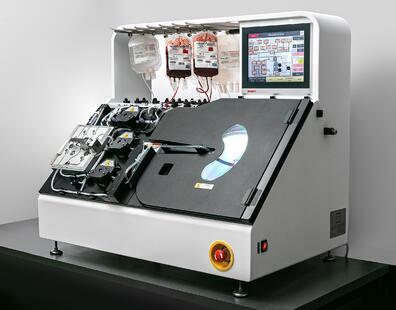 The CFC automates common cell processing functions such as labeling, selection, transduction, washing, and concentration, with minimal operator intervention and enables programmable integration of multiple processing steps – an example application is the production of Chimeric Antigen Receptor T-cell (CAR-T) therapies. HCATS and Invetech were integral to the conception, development and functionality of the CFC, which was awarded a 2017 Good Design Award®. Under the collaboration agreement, HCATS will serve as the process development and application specialist for the CFC, providing deep expertise in configuring the system to meet the specific manufacturing requirements of their global client base. Invetech will continue to manufacture the CFC under its ISO9001 Quality System and manage supply of the dedicated closed disposables. Through this collaboration, the CFC core technology can be further integrated into dedicated manufacturing platforms configured specifically to client process requirements, driving greater efficiencies for high-volume production. General availability of the CFC at HCATS and Invetech is expected in 2H 2018. Hitachi Chemical Advanced Therapeutics Solutions, LLC (HCATS, formerly PCT Cell Therapy Services, LLC), is a wholly owned subsidiary of Hitachi Chemical Company, Ltd. (Hitachi Chemical) representing Hitachi Chemical’s Regenerative Medicine Business Sector in the United States. HCATS leverages nearly two decades of experience exclusively focused on the cell therapy industry. It provides contract development and manufacturing organization (CDMO) services at current Good Manufacturing Practices (cGMP) standards, including clinical manufacturing, commercial manufacturing, and manufacturing development. Facilities to deliver these services under a global harmonized service platform have been established in Japan (Yokohama City, Kanagawa Prefecture), and in the United States (New Jersey and California), with an expansion to add commercial manufacturing capabilities and capacity underway in New Jersey. For more information about these services, please visit www.pctcelltherapy.com. Invetech has been creating breakthrough products and custom automation systems for more than 30 years. Invetech partners with global leaders in the life sciences industry to deliver product design and development, contract manufacturing and custom automation services. Invetech’s Cell Therapy group specializes in delivering end-to-end manufacturing platforms for regenerative medicine applications. The group brings deep experience in transitioning benchtop, development techniques to robust, commercially-viable automated processes. Over the past 15 years, we have served clients across the globe on more than 40 automation projects, honing our technology development methodology and building a broad portfolio of configurable platform technologies and process modules enabling reliable manufacturing establishment for cell and advanced therapies. To learn more, please visit www.invetechgroup.com. PCT Team Our leaders have worked on some of the major cell therapies of the past 10 years, and have extensive experience in pharmaceutical-grade quality and operations.